Give. For a Better Us. Every day, the YMCA of Sumter gives our community the support it needs to learn, grow and thrive. From advocacy to food security, disease prevention to athletics, childcare to dance classes, everything we do helps strengthen our neighborhood and the people who live here. But keeping Sumter great is a full-time job. Every day, our community faces new challenges that create a greater need for the work we do. And we need your help to do it. Your gift can help Sumter and everyone in it shine. 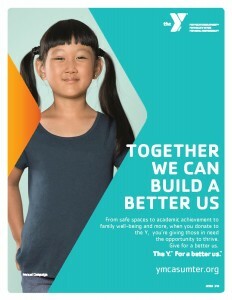 As a non-profit organization, the Y relies on generous donations from the community. Last year, financial support made it possible for 65 kids to have a safe place to learn and build confidence after school; for 270 families to reconnect and grow together; and gave 46 children access to reach their full potential at Camp Mac Boykin. With a focus on youth development, healthy living and social responsibility, the Y works to nurture the potential of children and teens, improve the nation’s health and well-being, and give back and support neighbors. Together we can build a better us! AmazonSmile is a simple and automatic way for you to support your favorite charitable organization every time you shop, at no cost to you. When you shop at smile.amazon.com you’ll find the exact same low prices, selection and convenient shopping experience as Amazon.com, with the added bonus that Amazon will donate 0.5% of the purchase price to your favorite charitable organization.You can choose from nearly one million organizations to support. Young Mens Christian Association of Sumter SC the name assigned to the Sumter Family YMCA.